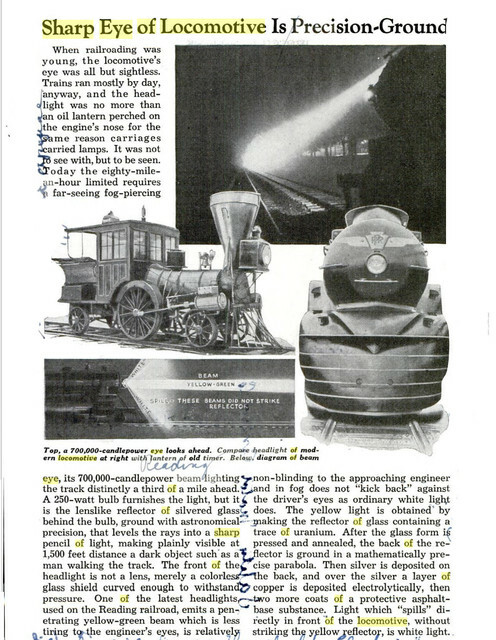 I have been searching information about The brightness of a headlight bulb which steam locomovites were using during 30s to 50s but I only can find some advertisments of Headlight company which sold Locomotive Headlight with a "250,000 candlepower" light bulb inside the headlight. Take PRR as an example, I have seen a lots of pic showing K4s, M1s, Js only had a tiny light bulbs which looks like a 40 watts incandescent bulb inside a prewar model Headlights with a larger reflector, post war engines like the S2 turbine, Q2, K4s with Headlight above the smoke box only had a much smaller headlight without light reflector inside, only painted white inside. I would like to know if there was any law about the Headlight brightness of the States's railroads? Did railroads in 40s used light bulbs below 100 watts to cut cost? Thank you very much! Many (most?) steam locomotives had a 32V DC electrical system. Not sure how that originated or how it was chosen. The steam turbine-driven dynamos on those engines can put out a lot of power, and are perfectly capable of powering bulbs which appear just as bright as those on modern diesels. But speaking of PRR headlights, their GG1 electrics in particular were known for having headlights that were never bright enough, from a crew's point of view at least. 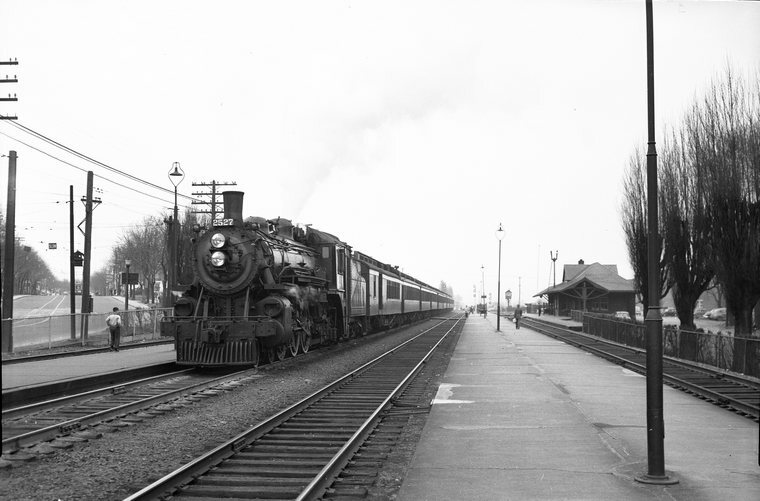 Just speaking of personal experience, for what it's worth, thirty-plus years ago we went for a ride on the steam-powered Morris County Central, a now-defunct tourist line that operated out of Newfoundland NJ. Anyway, it was a night-time ride called "The Moonlight Special." As the locomotive ( A 1907 Baldwin product if I remember correctly) made it's dramatic approach to the station someone said over the stations loudspeaker "Do NOT look directly at the locomotives headlight! It's as bright as the sun!" Whether or not it was original equipment or not I don't know, but that announcer wasn't kidding! That was a fun ride, by the way! 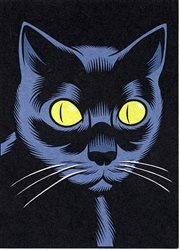 Anyway, it was a night-time ride called "The Moonlight Special." As the locomotive ( A 1911 Baldwin product if I remember correctly) made it's dramatic approach to the station someone said over the loudspeaker "Do NOT look directly at the locomotives headlight! It's as bright as the sun!" Thank you very much! 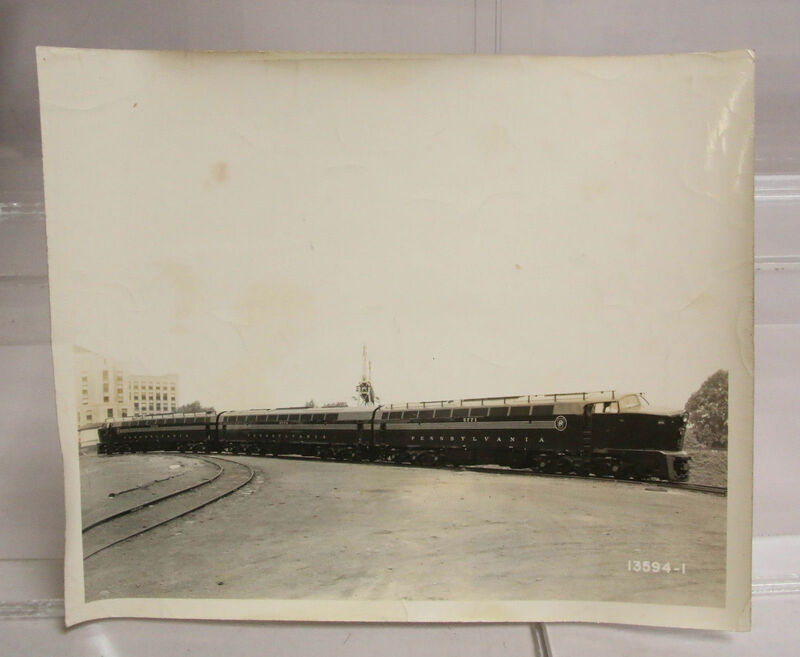 It seems that difference railroads had difference standard in the past. Milwaukee Road Hiawatha installed additional mar lights on their Class A and F7 Hudson in late 40s, almost at the same time period, PRR also added an small auxillary headlight on some of their K4s and all(?) of their T1s (but their GG1, PA and centipede etc still only had the original single headlight) NYC's Niagara had the headlight conversion (from single headlight to duel beam) in Nov, 1948, I wonder what was the reason behind these changes. Mars/Gyralites, etc. in that era had little to do with brighter headlighting; I have seen rotating sweep lights that spotlighted a much larger section of view but such an effect would be largely wasted on steam with long boilers or other impediment to forward visibility. Many of the red Mars-type lights were to show stoppage or UDE on multiple-track routes rather than grade-crossing safety. As I recall, the Pyle dual-beam lights used postwar on NYC power were primarily intended to keep a light burning if one bulb went out. A number of early E units featured a rosette of sealed-beam units in the hole of a reflector light; this gave about as bright a light as a non-arc light could produce from such a location. Many GG1s were given dual sealed-beam conversions (not protruding as the Pyle conversions for steam headlight casings were) and very late, so were a number of B&O engines. I have documentation of at least one PRR T1 with vertical sealed-beam conversion (in 1948) and to me this really improves the look of the 'second-generation' production front end. There is still some research going on as to what the T1 'auxiliary' light does. It does not oscillate, and it is not colored, so the supposition that it is a 'fog' light closer to the track in poor visibility may be correct. I mentioned the Morris County Central a bit earlier, care to see a bit of it? And a railfan home movie shot in 1974. Time flies, but memories last forever! Thank you very much! I didn't know that there was at least one T1 had its single headlight converted into a vertical sealed-beam! Was it a dual sealed-beam? I agree that the design of Headlights or its positing really affect the looks of an engine a lot, IIRC there were at least 3 conceptual design options of T1 provied by Raymond Loewy, one of them was a bullet shape smoke box design, another two was the "shark nose" smoke box design with smooth casting or stainless steel skin on the nose, these three designs had one thing in common which was the position of the Headlight. Unlike S1 and 5 streamlined K4s, The headlights on these designs were on the top half of the "smoke box" which were similar to Q1's (#6130 4-6-4-4) original streamlined design, its seems that the leader of PRR in 1930s did care about where the headlight should be installed and where the Keystone number plate should be placed. (S1 didn't have a Keystone number plate at the front end, T1 "front end with port holes version" had the Keystone number plate installed below the smoke box but they were "put back" to the smoke box, below the headlight on the modified version ) T1 were designed to haul long distance express trains, I wonder if there was any regulation about the brightness of their engine's headlights, beside the design of its overall apperance. The T1 picture I have (at a coaling tower in Indiana) is indeed double sealed-beam, with the bulbs vertical (as in the GG1s that were converted). It is possible (I have not yet found any drawings for the T1 conversion) that the mounting is the same basic or perhaps even detail design. It appears to be the same idea of putting the two bulb mounts in a plate and installing this in the opening for the reflector mount. I had very little experience with PRR reflector headlights EXCEPT to note that when the ones in E7s on the Bay Head line were on 'bright' and you were directly in line with the beam they were dazzlingly bright, about as bright as the sun to a 4-year-old watching from a car going across a grade crossing. I in fact thought (by comparison with the sealed-beam lights on some of the RS units going through Tenafly on the Northern Railroad) that this had to be one of those fancy 7-bulb high-speed lights, until the locomotive motored past, in Tuscan glory ... with relatively dim headlight appearance to the side. As with many laser applications, too much 'beam visibility' to the sides just shows that light's being wasted from the main purpose of illuminating the parts of the ROW the engine crew immediately needs to see. These lights did have reflectors, and some care was taken to design them so that the brightest part of the filament in the bulb was at the geometric focus of the parabolic mirror. On the other hand, of course there was a dimming function (or meets would have been dazzling just as an opposing crew would need reasonable detail vision to check the following train for problems). I do not know whether this was done with resistors or simply by controlling the turbogenerator, but there are people here who will definitively know. As you can readily imagine there is little use for the headlight as a road-illuminating device during the daytime, and particularly if regulated via turbogenerator speed (and hence steam mass flow conserved, which might be substantial) running dim in the daytime would have economy benefits, so I would not be surprised to find it was intended more as a safety device then. Think PRR E7s had brighter headlights than other E7s? Anyone got an E7 manual showing available choices? Think PRR E7s had brighter headlights than other E7s? Not at all, really! Just noting that the ones I saw were single-bulb reflector lights, and EXTREMELY bright in the line of the beam. All the seven-light arrangements I've seen were on older units (I think nothing more recent than an E6) and I don't know if these were 'factory' options or special order components. The history of 'optical warning' of high-speed trains is an interesting subject (some details are covered in Kratville's book on the UP Streamliners) as at least some of the idea was to provide very bright beams either projected in front of trains or vertically into the sky like rotating premiere searchlights to signal motorists that Something Significant Was Approaching. Since this was a prominent component of the later rationale for adoption of ditch lights, it may merit more attention than it has historically received. One very probable reason for disuse of the seven-bulb headlight would be the FRA requirement that all bulbs be working 'as installed' on inspection. Those familiar with the Southern Pacific's foray into safety lighting in the '60s will remember how that ended, with openings plated off ... and safety not at all enhanced. You can't judge how bright a headlight is during the day, cloudy or not. I drive along a rail line (actually two mainlines running parallel) going to and from work every day. During daylight hours, you can hardly tell the headlights are on. At night, they're incredibly bright. It's kinda like big league ballparks that shoot off fireworks when the home team hits a homerun. It's not very impressive during day games, much more visable at night. Note too that headlights have more than one brightness setting, so can be on, off or dimmed by the engineer. You can't judge how bright a headlight is during the day, cloudy or not. Thank you very much for your very detailed response! I really apprecicate it and I mostly agree with you guys. I did try to find pics or evdiences of steam locomotives headlight at night from 30s to 50s, but I can only found some touched up photos which probably used for promotional proposes. Anyway the answer is more clearer for me now after reading you guys first hand experiences or professional knowledges about lightings. To sum up, headlights of steam engines in the past was like a flashlight we use nowadays, it shoot a beam a long distance but does not necessarily light up all of the area close to the flashlight thus when people looks directly to it, it is as bright as the Sun, but it looks dimmer when people looks at it from the side. Assumes a headlight which had a light reflector installed, used a 100 watt (about 1000 lumens) incandescent bulb inside, I believe it was still bright enough during extreme weather at brightest mode, I have seen how a 1000 lumens flashing can do on youtube, its actually very bright. Assumes a headlight which had a light reflector installed, used a 100 watt (about 1000 lumens) incandescent bulb inside, I believe it was still bright enough during extreme weather at brightest mode, I have seen how a 1000 lumens flashing can do on youtube, its actually very bright. Headlight bulbs were brighter than that. Considerably brighter. Modern 'standard' voltage is 74, but some older systems that 'charged' at 72V nominal only provided 64V nominal battery voltage to devices such as lighting. Steam turbogeneration was (as I recall) generally in about the 32V peak range. Bulbs however are rated in watts (for a given nominal voltage) in indicating the I2R power dissipation and hence the candlepower/'lumen' output of the incandescence. Current PAR56 sealed-beam lights, per FRA (see 49 CFR 229.125) are 350W and produce 6200 nominal lumens initially (the light output degrades somewhat over the 500-hour nominal life of the lamp). Multiply this by two for the headlight, then add two for the ditch lights. It is common to see a SI equivalent, usually 200,000 candelas, used for the bulb's nominal light output. The 'standard' GE headlight bulb for steam applications was as I recall the 250P25 32V. (The size code represents 25 eights of an inch diameter, and P is a round envelope shape.) Initial output is 4650 lumens with nominal 500 hour life. Incidentally, that second picture is not of T1 5500, it is the 'replica' prow that has been constructed for the T1 Trust. 6200 lumens would be the bulb's total light output -- 200000 candela refers to the light intensity within the beam, lumens per steradian or some such thing. Thank you for correcting me Overmod, I can't believe I forgot the number of the T1 building by T1 Trust is 5550 not 5500! Speaking of T1s, I remember in the book "Black Gold - Black Diamonds: The Pennsylvania Railroad & Dieselization" by Eric Hirsimake, one of the problem T1 6110,6111 had were the sockets vibreated loose caused headlight bulbs failed. By the way, a 4650 lumens headlight with light reflector inside it must be very dazzling! One of the reason I am interested in this topic because I always think that Steam locomotive running at night with its headlight turned on is a very cool thing. I remember when I was a kid, I always draw steam engine on a sketchbook (even though I hadn't seen a steam engine in person until I grew up), adding headlights, paint the light beam in yellow on my fantacy steam engine was one of the funniest thing for me. Thank you very much for providing the light bulb model, with more keywords and details, I can't dig deeper on this topic. Thanks! I just watched a video demonstrate how powerful is a 6200 lumens flashlight on youtube, thats "crazy bright"! 700,000 candlepower is equal to 8.7 million lumens!! I can't believe it's true! Be difficult to work through all the necessarily-empirical measurements to determine what the "700,000 candlepower" represented. I would have to wonder if the mathematical conversions involved have given a result in line with those for modern sealed-beam lighting even though they are within an order of magnitude and use much better optics and focus adjustment. I do not think just applying the 12.57 factor from cp to lumens is going to give a meaningful result here. I don't know what appropriate conversion might need to be made for a PAR56 to give effective beam intensity in candela; erikem can backstop all these thoughts and calculations reasonably effectively. The glory 'few months' of the T1's. Beautiful scenes of running a T1, #5540. Lot of incredible scenes and information. How about those container cars! This is undeniably a pinnacle, perhaps 1946 being the crown after the war years. The Pennsy, and everyone else sure had their act together. Niagara s, T1's, S2, C&NW rebuilt Zeppelin's, N&W J's all pointed to an exciting, solid and foolproof future that was an illusion for the railroads. Mysteriously, to me anyway, is how Pennsy reported their first 'loss' in that year. By the time Sputnik sent shock waves the railroads were in full freefall, shopworn, deferred track maintenance, massive layoffs, considered outdated and old fashioned, the respect turned into ridicule. How it all went from 1946 to that point can be debated endlessly. For a very brief moment they sure had the confidence and ability to face the future little knowing the deck was stacked against them. Totally agree with you! I consider 35-46 was the golden years of the fallen flags, sadly part of the reason is because of the World War II boosted the traffic, and because of World War, Aerospace science and technology had a great leap forward and the federal government probably thought that spending as much as effort and resources to develop Aerospace was the most beneficial thing for the country and the world in long term (not going to talk about the "1952 Washington, D.C. UFO incident", that would gone too far and off topic ) thus the railroad industry “probably” became a secondary thing in the federal government's point of view and they milked all railroads as hard as they could by heavy taxes. The fallen flags had no chance. There are so many mysterious things and unanswered questions for me about all those restless mistakes the leaders of PRR had made during this period like why they used Franklin Type A poppet valve gear instead of the newer and more reliable Type B on T1s (except 5500 which was considered the best T1 they had)? Why they purchased so many problematic Diesel Engine like "Centipede" and BP20 from Baldwin in post war period without any testing in advance? IIRC they tested the M1 prototype for 2 years before mass production. why they used Franklin Type A poppet valve gear instead of the newer and more reliable Type B on T1s (except 5500 which was considered the best T1 they had)? Why they purchased so many problematic Diesel Engine like "Centipede" and BP20 from Baldwin in post war without any testing in advance? 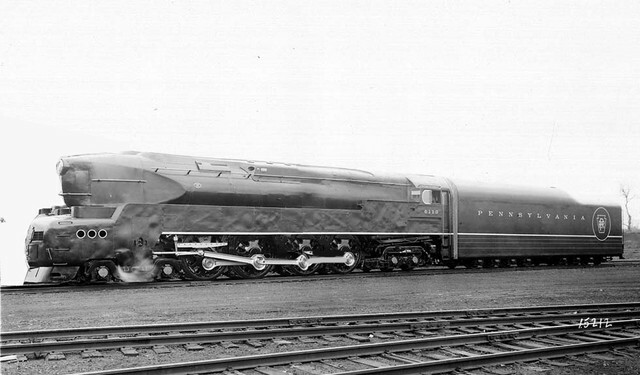 It may be important to recall that as late as April 1945, the 'future' of New York Central high-speed passenger power was the C1a, a locomotive that shared many details with the T1 (including very short stroke and ultra-lightweight rods) but which from the beginning used a correctly-sized firebox (albeit fired more economically to take advantage of the nominal lower water rate) and right-sized Baker gear. I believe it is clear that the 64T version of the pedestal tender would give full Harmon-to-Chicago range for the C1a, but not alternative designs which is one reason you never saw the design tried on Niagaras. 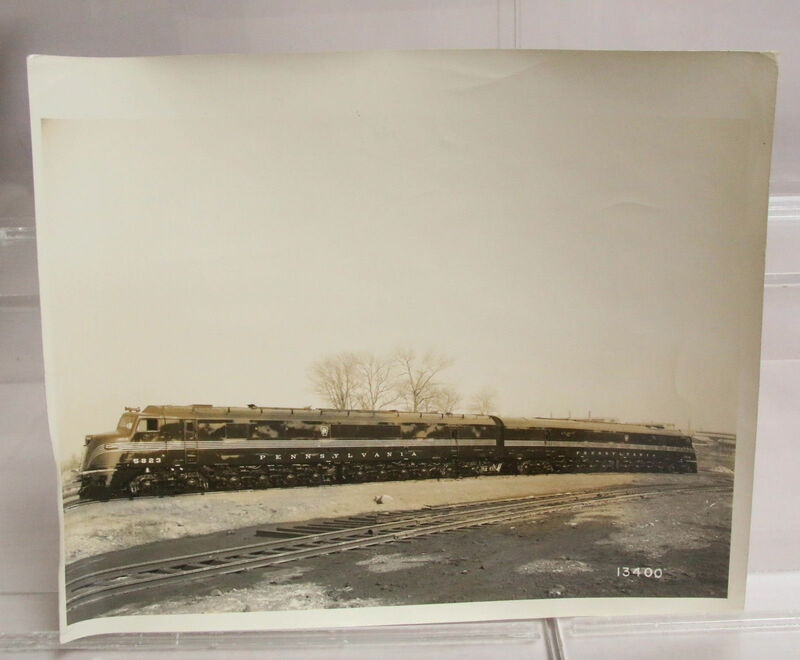 At that time in development work, the Niagara was still considered more of a derivative of the Rock Island and D&H 4-8-4s, with some improvements in the boiler, steam separation, and running gear. I don't think it was fully understood how useful a free-running, well-balanced 4-8-4 could be until the 79" drivers had been put on; there were still some teething troubles with lateral deflection of the running gear that may or may not have led directly to reducing steam pressure (you can find some truly terrifying pictures of the aftermath of lateral buckles if you know what you're looking at) but there wasn't much argument within just a few months that the Niagaras did everything NYC expected from the C1a except the unrefueled range ... and without all the panoply of drawbacks associated by then with the duplex configuration. Baldwin didn't have much chance to get long-term testing of the Centipede passenger locomotives, more because EMD had E7 design in the can by 1945 and to be competitive Baldwin needed something very high speed, very fast. To be fair this was still in the era where Baldwin thought they would have high-speed diesel prime movers (412s, then 408s) in the Essl modular design, and then fairly quickly develop free-piston power for the best combination of flexibility, production cost, and maintenance. When all that didn't work out they were left with tugboat engines, very good tugboat engines but not much of an answer for high horsepower and reasonable CG; the real problem was Baldwin build quality mirroring their steam-locomotive production in too many ways with too many detail-design catastrophes. I don't think that could have been predicted by PRR (which as we know was shockingly lacking in sensible design acumen at many points in their motive-power history!) and the Dilworth team was probably not giving away the crown jewels of what made EMD competitive from the Locomotive 103 days forward. You have written extensively on the major problems with Baldwin Diesel locomotives. Now they had good data and success with E7's on the Detroit Arrow early on. There is no doubt they held a loyalty for long time friend and ally Baldwin. The orders for the Centipede's and Bp20 Passenger Sharks were not massive but they were substantial. It's easy to see the trust was there beforehand but in reality they rolled the dice and lost. Hey here's a thought. What if the PRR had hired Paul Keiffer right at the start instead of the New York Central?!!! Now that could be some interesting alternative history. 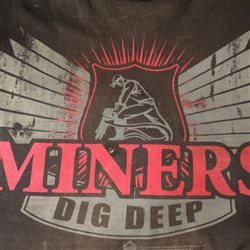 Thank you Overmod and Miningman! I never expect that I can learn so many things from this forum, I really appeciate you guy's generous sharing! Speaking about the T1s, if I was the leader of PRR, I would have agreed with Baldwin's suggestion, or you could say a warning, to not risky using the Franklin poppet valves on the first 50 T1 order. It is proved that Baldwin was right and the first order was the one and the only one order for the production version of T1. Despite the glowing test reports of 6110 and 6111 from the test plant, the operational performance of the production version was far from satisfactory. I do agree with some people's view that Franklin poppet valves played an important roles to "encourage” PRR to ditch reciprocating steam locomotive, but I never think it was Franklin's fault, it was probably just a result of mismatch and misuse (T1 was often used to make up time by excessive speeding) and T1 really came too late. I wonder if PRR set a speed Limit for T1 at 90-95mph would help or not, (the average operational speed between Chicago and Pittsburgh, PA was 66.9mph in 1938.) Beside speed, I don't understand why the front end of T1 were not made "foldable" /removable like a front-end cover of a automobile or German DB Class 10 / BR 10 001, 002(it was built a few years after T1's retairment though), how could the leaders of PRR approved something that was so observiously impractical! ...... Anyway, I am still studing this topic because I actually love PRR's duplexes, all of them! 32V is what you get from 16 lead-acid cells in series, a very common voltage used in RR passenger cars, farm generating plants (Delco was a big producer of these beasts), and windchargers for farm use. A lower voltage filament was a lot more rugged than the equivalent wattage at 110VDC. Back in the 1920's & '30s, there was a significant market for 32V appliances, toasters, mixers, refirgeators, etc. This was a time when many apartments in the downtown sections of big cities had DC power, utilities running anywhere from 25 to 133Hz, so making 32V appliances wasn't much of a problem. Keep in mind that tungsten filaments have a positive tempco for resistance, so the brightness scales with voltage with a power somewhere between 1 and 2. Carbon filament bulbs had a negative tempco, which meant that brightness scaled with a greater than 2 power of the voltage. Part of the production process with carbon filament bulbs was to put a bunch of bulbs in a box and vary the voltage to determine the rated voltage for the individual bulbs - IIRC, the bins were 5V wide. Agree with you. IIRC Centipede's was supposed to perform as good as GG1 toghter and BP20, PRR had high hopes of them and assigned them to haul their prime train The Broadway Limited, that is probably one of the reason the order was not really big. Turn out, in terms of performance, they were even worse than T1s and got relegated after a few years in service. They were some very good looking and interesting early diesel engine but I do believe that Baldwin really pissed off PRR HQ in this case. Imagine PRR adopted the N&W J class with larger Drivers instead of wasted tons of money to buy untested early diesel for passenger trains...... Imagine PRR spent more times and resources to improve the quality or even redesign their rail tracks between Chicago and Pittsburgh to increase the average speed from 67mph to 90mph or more, shorten the total travel time between New York to Chi town from 16 hours to 14 hours or less......Imagine PRR cherished their steam engine like Class S1, Q2, T1 and rebuilt heavyweight passenger cars and sleepers instead of buying tons a brand new passenger cars from Budd when the overall ridership was observably unsaveable in late 40s......these are some hindsight thing from me, but c’mon, imagine is a fun thing! A publicity pics off PRR, but looks real and cool. Never have seen a similar pic of T1, Q2 though. CP 2527 with Two 2 Headlights on Test w wood consist. 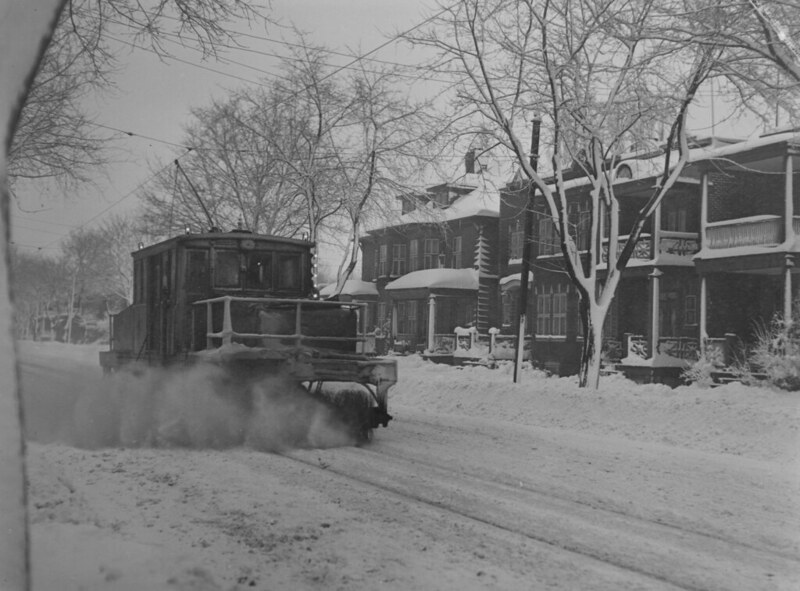 Note Nachod Signal to left governing entrance to single track on curve, Montreal Tramways. 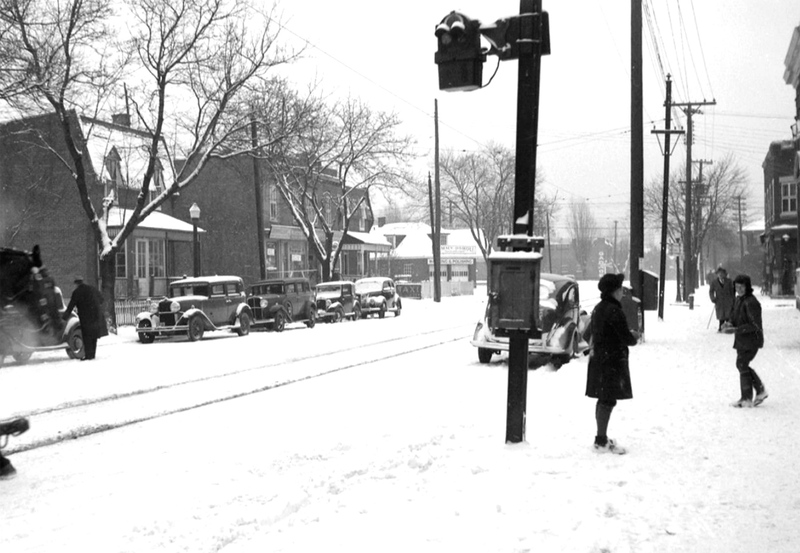 Opposite Signal, 1938. Montreal West Tower to right. Note horse on milk wagon. Tramways Sweeper. Single Track. 1938. Track laid to one side of road in anticipation of future Double Track. Never done. Converted to Autobus June 1953.